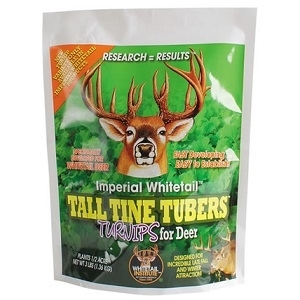 Imperial Whitetail Tall Tine Tubers (Annual) 3 lb. It took six years to develop the new turnip variety in Imperial Whitetail TALL TINE TUBERS. The result is the most attractive turnip variety the Whitetail Institute could develop or has ever tested. TALL TINE TUBERS provides two forage sources for late fall and winter. First is foliage that grows very quickly and becomes sweeter with the fall frosts. Second are sweet tubers that can grow as large as a softball and delivers an additional food source through the winter. TALL TINE TUBERS is designed to establish and grow quickly, produce lots of tonnage, and attract and hold deer during the early and late hunting seasons.